Mil-Spec Personal Disaster Preparedness Kit | BUDK.com - Knives & Swords At The Lowest Prices! Are you prepared for an emergency at a moment's notice? Would you be prepared if disaster struck right now? 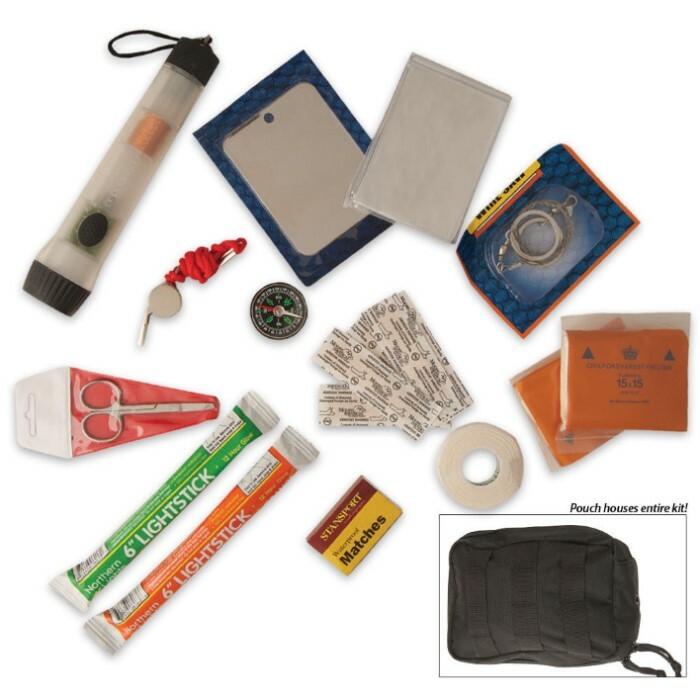 You can be one step closer to preparedness with this Mil-Spec Personal Disaster Preparedness Kit filled with a wide variety of necessary and useful emergency items. The two-way zippered pack cloth pouch houses lightsticks, matches, a Forever Flashlight that requires no batteries, a signal mirror, a wire saw, a whistle, and a directional compass. The separate first aid compartment includes stainless steel scissors, a roll of gauze, adhesive tape, and bandages. This Mil-Spec kit is perfect for your home, office, and automobile. Measures 6"L x 2½"W x 8"H.